A chip shop has been ordered to remove a banner which hails it as the birthplace of the deep fried Mars bar. The Carron Fish Bar in Stonehaven, Aberdeenshire, attracts tourists from around the world who want to try the recipe. It proudly displays a banner on the side of the building claiming staff there invented the snack. But Aberdeenshire Council has now said it must come down "for the good of the wider community". The deep fried Mars bar has become synonymous with negative aspects of the Scottish diet since 1995 when the Daily Record reported on "Scotland's craziest takeaway" being served at the Stonehaven chippy, previously named The Haven. "Sweet-toothed youngsters are ordering their favourite choc bars deep-fried in batter," the Record said. By 2004, the reputation of the snack had travelled the Atlantic and it was mentioned on the Jay Leno Show in the US. Carron Fish Bar owner Lorraine Watson said the proposed ban was "ridiculous" and she would "definitely not" be taking the banner down. Mrs Watson said: "Thousands and thousands of tourists come from all over the world to purchase the deep fried Mars bar from the birthplace. "They stand outside under the banner with their Mars bar, smiling from ear to ear, then go home and let all their friends and family see it. "We have no idea why the council would want this banner taken down, bearing in mind it takes thousands of visitors to the town. "Isn't that what we are trying to do? Aren't we trying to boost tourism in Scotland?" Aberdeenshire Council issued Mrs Watson with the ban as part of a plan to smarten up business premises in the town. A council letter sent to her said: "Following a thorough walkabout and inspection, an action plan has been drawn up. "Many of the actions would fall to individual property owners and one of them relates to your property. What needs to be done: Remove banner." A spokesman for Aberdeenshire Council said: "Together with a range of community organisations we have been looking at ways to improve the look of Stonehaven for the benefit of residents, businesses and visitors. "An action plan has been created in conjunction with the Stonehaven Town Partnership, Community Council, Stonehaven Business Association and the Horizon Group. "As part of the action plan we have asked some owners in the area to consider making alterations to their properties. This included asking the owners of The Carron Fish Bar to consider removing their banner. "We do not wish to prevent the owners from promoting their business and we would be happy to have discussions with them regarding the banner." It is not the first time Mrs Watson has faced a fight over the treat. Chocolate giant Mars wrote to her in 2012 distancing itself from the recipe. The company said it could not authorise or endorse the product which went against its policy of promoting a "healthy lifestyle". 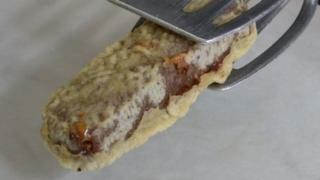 Deep-fried Mars bars: A symbol of a nation's diet?